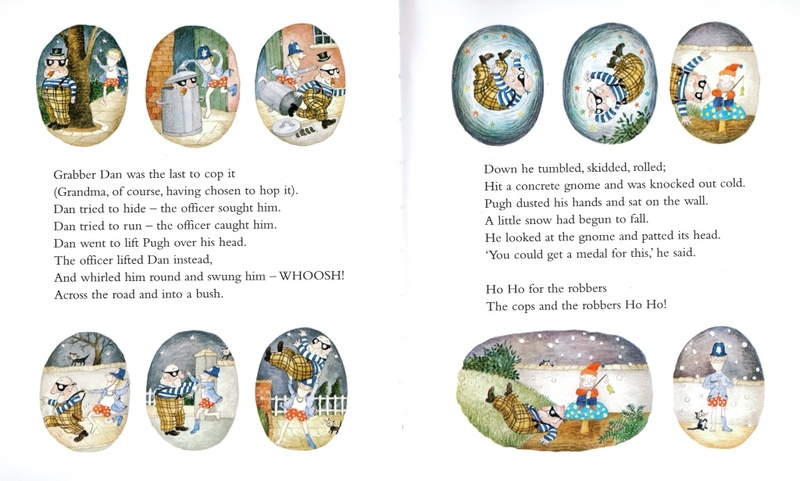 A favourite sub-genre of Christmas tales for children is the festive robbery story. The Grinch Who Stole Christmas, Home Alone and that episode of the Simpsons where Bart burns down the tree and blames it on burglars. I guess it plays into the underlying unease of a festival that allows a strange bearded old man to creep into your children’s bedrooms. The outstanding British contribution to this warped tradition is the Ahlbergs’ Cops and Robbers. 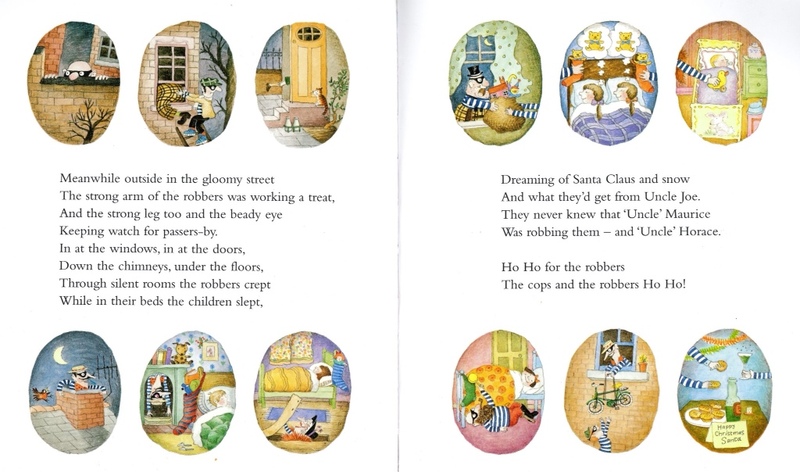 The great couple of children’s literature have previous with housebreaking; their Burglar Bill book is an undoubted classic. 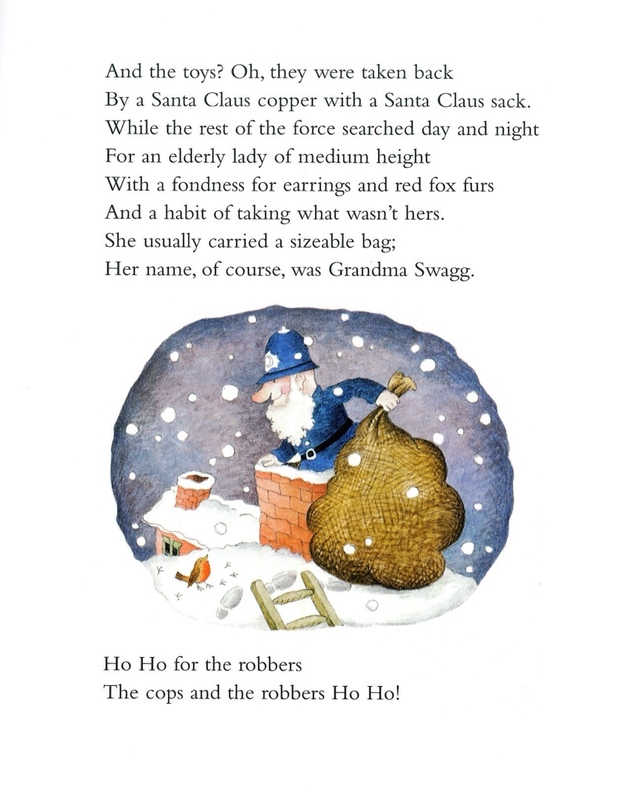 But where Bill and his squeeze Burglar Betty find redemption through love and return their presents, this tale has a whole gang of Ealing style robbers, with names like Grabber Dan, Billy-the-Bag and best of all crime Queenpin, Grandma Swagg. Pugh single handedly rounds up the gang (in his underwear) locking them up beneath the station, before being hoisted on to his colleagues shoulders at a joyous Christmas party. The knees-up is a fine example of the illustrated cross section, something we’ll be seeing more of over the advent. The details here are fantastic, including a bizarre map of the UK, the spare helmet shelf and a quick trip to the gents. 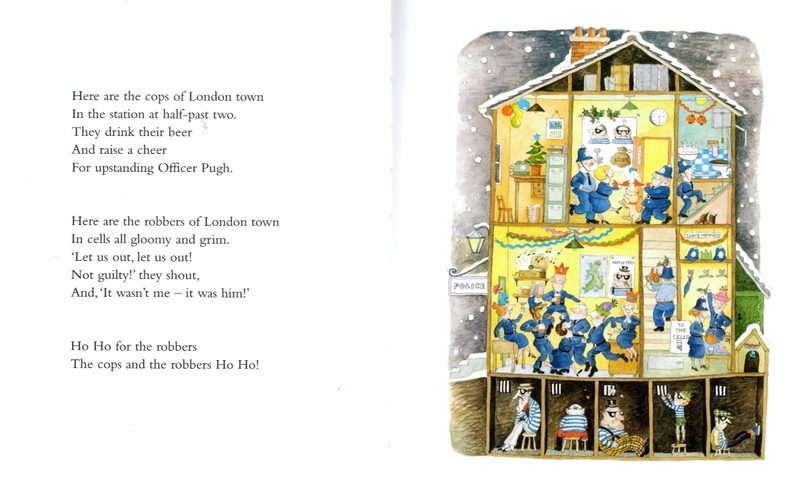 The following night Officer Pugh dons the white beard and heads off down the town’s snow covered chimneys. Christmas is back on, but lock your doors, Grandma Swag is still on the loose. This is a fabulous favourite – and a brilliantly clever theme for Christmas too, I never would have thought of it.